of ovoid form, resting on a flat base, the steeply rounded shoulders incised with three double-line collars, the wide mouth with rolled lip, the slightly domed cover with matching double-line collars encircling the bud-shaped knop, the smooth surface with scattered dark reddish brown patina and showing the pseudomorph of ancient silk wrapping in areas of bright green malachite corrosion on one side. 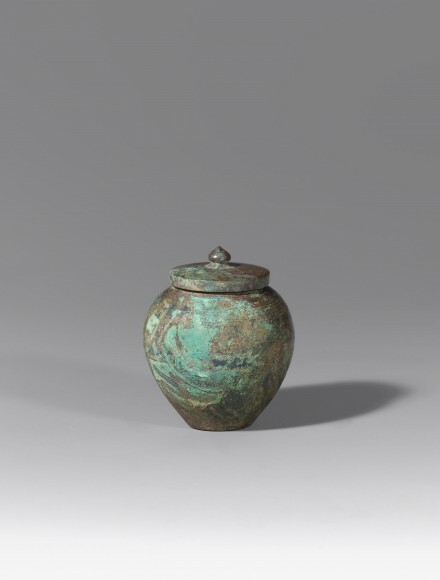 Compare the small bronze jar of this form, without the lid, in the collection of Kubosō Memorial Museum of Art, Izumi, illustrated in the catalogue of special exhibition Chugoku no kyōdō: rokuro hiki no seidōki (Tin-Bronze of China: Bronzes of the Potter’s Wheel), Osaka, 1999, p. 45, no. 88.